Although manufacturing jobs were previously perceived as low-skilled and low-paying, Americans believe the industry is growing stronger. Today, these jobs are increasingly high-tech because they require engineering skills blended with traditional manufacturing skills. However, human resources professionals are still struggling to find motivated, qualified candidates. If that's an issue for your business, here are some tips to find the right people for the job. When you identify the basic skills and abilities required for the job, don’t include skills that can be learned quickly in the first week or two on the job. This prevents potential candidates from getting scared off if they're not familiar with your specific programs or processes. Set the selection criteria to allow minimally-qualified candidates through the initial stages of the hiring process. Be sure to focus on the appropriate factors and meeting legal standards. Creating a job description that states the minimum qualifications — and posting it early in the selection process — will help candidates understand clear job expectations and allow you to use the criteria to quickly screen candidates from the process. Today’s hybrid manufacturing jobs require a variety of skills, so widen your focus to include more than manufacturing graduates or professionals. Veterans — who were trained to use technology in military applications, for example —often have a skill set that can be readily adapted to manufacturing. They are trainable team players who can learn complex subject matter and work under pressure. Business always runs smoother when you have a strategy, and that includes your hiring process. 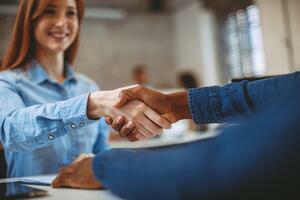 Here are some considerations when creating a hiring strategy. Despite Americans believing the industry is strengthening, many still find manufacturing jobs uninteresting, unrewarding, and unstable. According to a Deloitte and Manufacturing Institute survey, the majority of Americans surveyed (1,000 citizens surveyed from 50 states) believe manufacturing is vital toward maintaining an average way of life. However, fewer than 30% of them would encourage their child to pursue a manufacturing career. Not to worry, the study also found that public awareness of the industry is growing. The more you can break the stigma the better. Spread your message at local high schools, community colleges, and technical schools. Invite students, parents, and educators to an open house at your company. Prepare employees to talk about the new breed of manufacturing jobs, what your company needs and has to offer, and how new employees can grow a meaningful career with good income potential. Another way to spread the word is to hire teachers for short-term, temporary jobs in the summer. When they return to school in the fall, they can tell their students firsthand how important it is that they learn math and science. Provide a glimpse of the day-to-day activities performed by the team in their work setting. Feature positive and realistic testimonies by team members that describe their jobs and work environment. Video helps showcase what it would be like to work for your company. Help your employees understand the opportunities for career growth and display the cross-training available to them. Offering more than just a job to all employees helps to create a culture in which each person is important and valued. When everyone has a vested interest in the success of the company, there’s a lot more incentive to help it grow. This ties employees in with the business, because the harder they work, the better the company performs, and the better their pay. Reward your current employees for recommending new hires. Everyone has a network, and many of your employees may be incentivized to talk to their friends if they know there’s a reward in it for them. Younger employees value their personal and family time and like to choose when and how they spend it. Offer flexible work schedules and paid leave policies. Be more flexible with vacation schedules. In addition to competitive pay, let your employees know they’re appreciated. Give them opportunities to advance. Listen to their ideas. Treat them well and with respect. By taking some or all of these steps, you're sure to attract some qualified and motivated hires.